European Commission President Jean-Claude Juncker said he was “very confident” of a “swift agreement this year”. Japan is the EU’s sixth largest trading partner in the world. For Japan, the EU occupies third place. The volume of trade between the two amounted to an estimated €125 billion in 2016. The EU is accelerating negotiations on all fronts with the advent of the Trump era. In his plans to boost homegrown companies, Trump has proposed a 20% tax on imports and has taken an ambiguous, wait-and-see approach on the Transatlantic Trade and Investment Partnership (TTIP). In the process, the president has also withdrawn US support for the Trans-Pacific Partnership (TPP), which included Japan and other 11 partners. 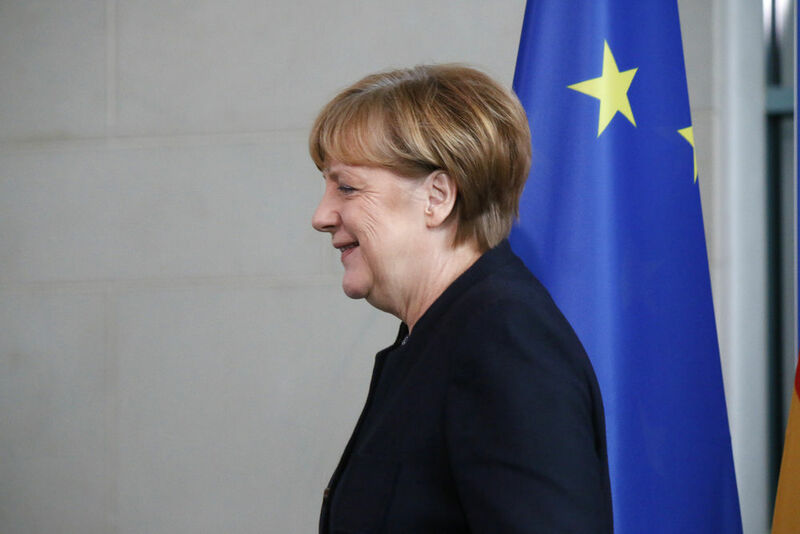 On Monday (20 March), German Chancellor Angela Merkel and Japanese Prime Minister Shinzo Abe called for the preservation of free, open and fair trade. In the face of an isolationist US, the meeting took on a different tone from the past 13 meetings between Abe and Merkel, who met in Hannover at the CEBIT fair after she held inconclusive talks with Trump at the White House on Friday (17 March). German Chancellor Angela Merkel and US President Donald Trump found little common ground on Friday (16 March) on the management of the refugee crisis, but promised to work out compromises to overcome the dispute over the trade relations. “Japan and Europe must work with the US and raise high the flag of free trade,” the Japanese leader said in a joint news conference after the meeting. “Chancellor Merkel and I agreed that a free and open global order is the foundation of peace and prosperity,” Abe told reporters. Free trade is extremely important for both countries, Merkel said. 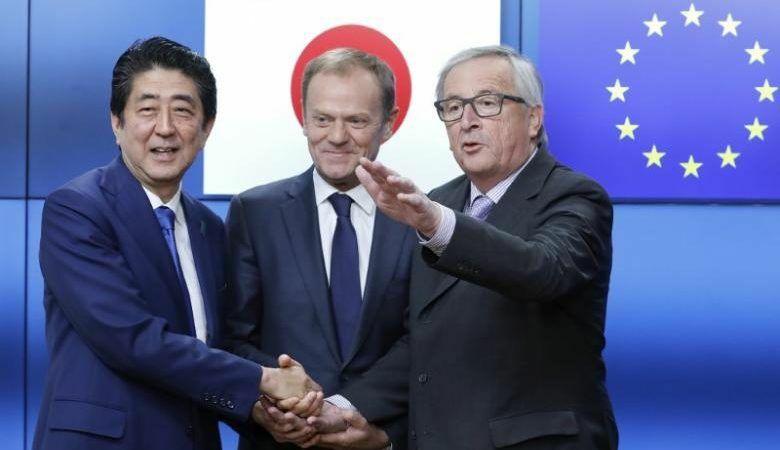 But in Brussels, Abe added that deeper cooperation between the EU and Japan should be done in conjunction with the United States. “In the midst of troubling protectionist trends, I find it important for Japan and the EU to cooperate with the United States as well, to give the world a model of free trade,” he said. CETA or South Korean models? The EU-Japan trade deal is comparable to the Comprehensive Economic and Trade Agreement (CETA), negotiated between the EU and Canada, an EU official said. But at the moment, the FTA between the EU and Japan resembles the one concluded between the EU and South Korea in 2011, and seems to be the likeliest outcome politically, experts say. Like in the CETA deal, the devil is in the details. “As often in a negotiation, the few remaining issues are the most difficult to solve,” Juncker said. The EU wants Japan to remove tariffs on EU foods, open up public procurement especially in the rail industry and reduce non-tariffs barriers for cars. In return, over time, the EU is ready to reduce the 10% tariff on Japanese cars and make it easier for Japanese executives to work in Europe. According to a Bertelsmann Stiftung study, the economic effects on both sides would be rather modest for a Korean-type scenario. With a conservative scenario, Japan would increase its economic output by €9 bn or a 0.23% GDP increase compared to 2014. For the EU, the increase will be of approximately €11 bn, equal of 0.1% of total EU GDP. The situation would be different if both parties strove towards an ambitious free trade agreement in which the non-tariff trade barriers were reduced to the average level of all existing free trade agreements – thus making them much lower than those in the agreement between Brussels and Seoul. However, more important than the potential GDP increase, would be the strategic significance as the agreement could contribute to filling the void in the world trade order created by the US. “Japan should not let itself be unsettled by the USA’s withdrawal from the TPP and should be cautious with regards to potential negotiations on a bilateral FTA with the USA. Japan too can only lose from Donald Trump’s “America First” policy,” said Cora Jungbluth from the Bertelsmann Foundation.